Last January, Buffalo Common Council President Darius Pridgen announced that the city government would support the development of a community land trust in Buffalo’s Fruit Belt later. Now, Buffalo has taken the next step, after approving “a strategic development plan for the largely low-income neighborhood abutting the Buffalo Niagara Medical Campus,” writes Susan Schulman in the Buffalo News. Included in the vote was the transfer of “four of what could be 20 or more vacant lots the Fruit Belt land trust,” writes Schulman. Schulman adds that the Council’s action also moves forward the redevelopment of “an historic but run-down vacant property.” The City is also offering existing homeowners the option of acquiring adjacent vacant lots, as a tool for reducing the number of vacant lots in the neighborhood. As Alexis Lipsitz Flippin writes in Next City, the Fruit Belt neighborhood is named for “the flowering fruit orchards planted there by German immigrants.” As Flippin notes, the neighborhood “has struggled since the 1950s, when construction of the Kensington Expressway split the area in half, destabilizing what had been a peaceful district, decreasing property values and driving out long-time residents.” In the past few decades, neighborhood population has plummeted from more than 11,000 as of 1970 to an estimated 2,670 people today. 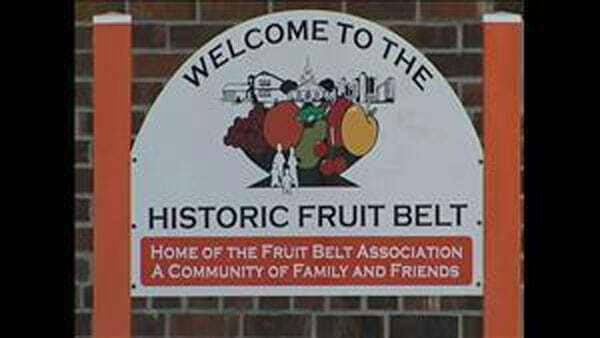 According to Pridgen, plans for many of the remaining 200 vacant Fruit Belt parcels will be discussed in coming weeks. Pridgen has also pledged that residents will have a voice in how those parcels are developed. According to Pridgen, development plans will be reviewed by a resident body known as the Fruit Belt Advisory Council, which in turn will make recommendations to the Common Council. Harper Bishop, director of equitable development with Open Buffalo, which has been advocating for a land trust in the Fruit Belt, says that his group will work to ensure that an inclusive decision-making process prevents displacement and preserves housing affordability. For its first four lots, the land trust is looking to partner with Habitat Buffalo and Belmont Housing. But beyond housing, the larger goal, both Walton and Pridgen agree, is community revitalization. Pridgen notes that, “People want retail and services back. They don’t want to have to drive across town for goods and services.” The Fruit Belt community, Walton adds, also is looking for more opportunities for jobs and wealth generation in their community. This scam was aimed directly at small, cash-strapped nonprofits, and it has left some in a world of financial pain.